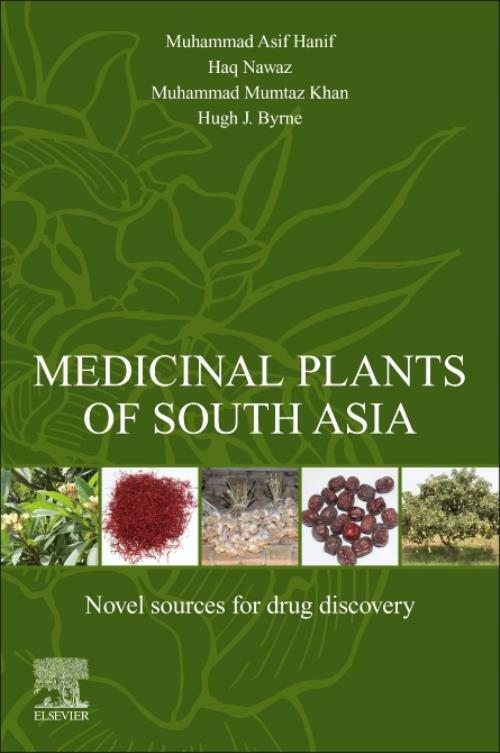 Medicinal Plants of South Asia: Novel Sources for Drug Discovery provides a comprehensive review of medicinal plants of this region, highlighting chemical components of high potential and applying the latest technology to reveal the underlying chemistry and active components of traditionally-used medicinal plants. Drawing on the vast experience of its expert editors and authors, the book provides a contemporary guide source on these novel chemical structures, thus making it a useful resource for medicinal chemists, phytochemists, pharmaceutical scientists and everyone involved in the use, sales , discovery and development of drugs from natural sources. Dr Hanif is an Assistant Professor & Group Leader at the Nano and Biomaterials lab within the Department of Chemistry at the University of Agriculture, Faisalabad, Pakistan. His work focuses on natural products and their analysis using advanced analytical chemistry, and he has published over 120 peer reviewed journal articles, 7 books/manuals and several book chapters. In addition, Dr Hanif has supervised over 40 M.Phil students and 3 PhD students. For outstanding contributions, he has made to the scientific development through the application of basic and applied scientific research particularly in the field of Chemical Sciences (Chemistry), and his unmatched services to community as the benchmark of excellence, the Pakistan Academy of Sciences has awarded him prestigious "Gold Medal in 2019. Dr Nawaz is an Assistant Professor with the Nano and Biomaterials Lab within the Department of Chemistry at the University of Agriculture, Faisalabad, Pakistan. His research focuses on natural products and their analysis using advanced organic chemistry, and he has published over 35 per peer reviewed journal articles and several book chapters. Muhammad Mumtaz Khan is an Associate Professor of Crop Production/Horticulture in the Department of Crop Sciences, College of Agriculture and Marine Sciences, Sultan Qaboos University, Oman. He has over 30 years' experience in research and teaching crop science with a particular focus on horticultural crops and nutraceutical horticultural plants. He has published more than 150 peer reviewed journal and conference papers, edited one book on Lime and several book chapters. Since he started academic career, he has taught range of undergraduate/postgraduate courses and mentored large number of M.Sc. and Ph.D. candidates. Due to his pioneer work and ability to express novel findings and his services to science/agriculture and community, the Government of Pakistan has awarded him prestigious Presidential Award ''Izazi Fazeelat'' in 2007. Prof. Byrne is Head of the FOCAS Research Institute at the Technological University of Dublin, Dublin, Ireland. He has over 30 years' experience in research science and has published over 300 peer reviewed journal and conference papers. Byrne has been responsible for over ?25 million in funded projects and has supervised over 30 PhD students. His principal research interests are in applications of spectroscopy and the study of molecular and nano-materials, and biospectroscopy for diagnostics, cytological analysis and nano-bio interactions.